Inventory We are a resale marketplace, not a box office or venue. Ticket prices may exceed face value. This site is not owned by Verizon Theater Grand Prairie . 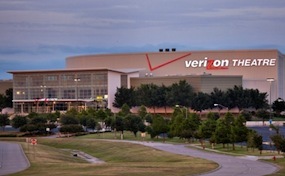 The Verizon Theater at Grand Prairie opened in 2004 as a premier venue located at 1001 Performance Place Grand Prairie, TX, between Dallas and Fort Worth. The Theater at Grand Prairie tickets has a maximum distribution of 6,350 for any given performance. The Verizon Theater, which was formerly known as the Nokia Theater at Grand Prairie, has received much praise for its state of the art facilities. The Nokia Theater at Grand Prairie hired Calvin Booth to paint 4x4 portraits of visiting performers. The Verizon Theater at Grand Prairie box office, has catered to over 300 different events since opening. Verizon.TheateratGrandPrairie.com is not affiliated with any official site or primary box office. We specialize in providing the low prices and a large inventory supply for all secondary market events. To purchase your tickets for any Verizon Theater at Grand Prairie events call our operators at anytime or simply click on the event you wish to attend.